July 10, 2017 — Michael J. Stamos, MD, has been appointed dean of the UC Irvine School of Medicine. He has served with distinction as interim dean since February 2016. Under Stamos’ leadership, the School of Medicine recently received the highest accreditation possible from the Association of American Medical Colleges/AMA Liaison Committee on Medical Education. He has led the school’s faculty cluster hiring initiative and has been a key partner in developing and executing the UC Irvine Health Strategic Plan. Stamos joined UC Irvine in 2002 and established the Department of Surgery’s Division of Colon & Rectal Surgery and its residency program. Between 2010 and his appointment as interim dean, he was a professor and the John E. Connolly Chair in Surgery. Prior to coming to UC Irvine, he spent 11 years at Harbor-UCLA Medical Center, while also serving as chief of colon and rectal surgery at the VA West Los Angeles Medical Center. "Our university’s obligation to be a leader in translational research, complex care and innovative medical education has never been more important," said Howard J. Federoff, MD, PhD, vice chancellor, health affairs, and UC Irvine Health CEO. "Under Dr. Stamos’ leadership, the UC Irvine School of Medicine will achieve even greater distinction." An esteemed clinician, researcher and leader, Stamos is recognized as an international expert in the minimally invasive treatment of colorectal cancer and has directed many multicenter clinical trials. He was an early proponent of the American College of Surgeons’ National Surgical Quality Improvement Program. The UC Irvine Department of Surgery routinely achieves top outcomes in this program and received impressive patient satisfaction scores during his tenure as chair. 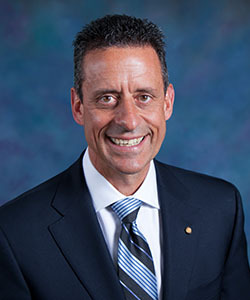 Stamos earned his medical degree at Case Western Reserve University’s School of Medicine and served his residency in general surgery at Jackson Memorial Hospital, affiliated with the University of Miami’s Leonard M. Miller School of Medicine. He completed a fellowship in colon and rectal surgery at Ochsner Medical Center in New Orleans. He is currently president of the Research Foundation of the American Society of Colon and Rectal Surgeons and is past president of the American Society of Colon and Rectal Surgeons and the American Board of Colon and Rectal Surgery. Leslie M. Thompson, PhD, professor of Neurobiology & Behavior and Biological Chemistry, chaired the dean’s search committee. UC Irvine School of Medicine is affiliated with CHOC Children's Hospital of Orange County.